Mary Violet Leontyne Price was born February 10, 1927, and raised in the colored section of Laurel, Mississippi. Her mother, Kate, was a midwife, and her father, James, worked in a sawmill. She was nurtured under the watchful eye of the community, which extended even to her aunt's employers, The Chisholms, a family who lived in a white, affluent section of town. Her musical talents were encouraged, and her voice frequently was heard at area social events. Price received a scholarship to attend Central State University, Wilberforce, Ohio. She began as a music education major, but she completed her studies there in voice. With the assistance of Paul Robeson and the school's administration, in addition to the financial backing of the Chisholm family, Price next went to Juilliard. While attending Juilliard, she appeared in revivals of Gershwin's Porgy and Bess and Four Saints in Three Acts, by Virgil Thomson. The Porgy and Bess cast toured the United States and Europe with baritone William Warfield and Price singing the title roles. The two singers married in 1952, but the pressures of their separate careers eventually forced them to part. Price was engaged to sing the lead for the National Broadcasting Company's production of Puccini's Tosca in 1955. There were strenuous objections, and some cancellations, from local affiliates; nonetheless, her dramatic portrayal and vocal performance in this historic broadcast were a critical success. Other televised operatic roles soon followed. Then, in 1957, Price sang Verdi's Aida for the first time. She identified strongly with the character, and her success led her to Vienna to sing for conductor Herbert von Karajan and, in 1960, to the stage of La Scala. In January, 1961, she debuted at the Metropolitan Opera as Leonora in Verdi's Il Trovatore. Her performance was a success not only to the audience who witnessed it, but to the New York critics as well. She was signed for additional roles there and at other houses around the world. 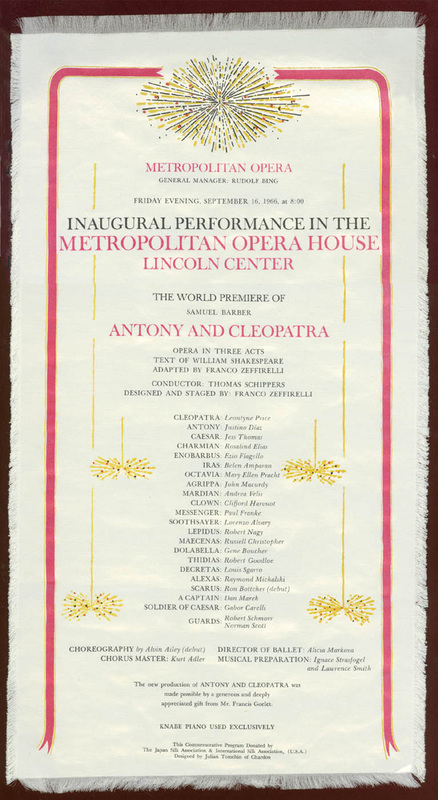 By the mid 1960's, her reputation had grown to the extent that she was offered the lead in the Samuel Barber opera commissioned especially for the opening of the Met's new facilities at Lincoln Center. 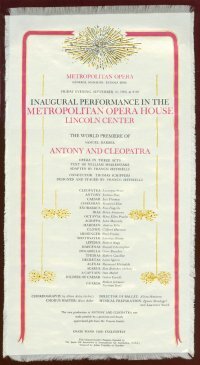 The opening performance of Antony and Cleopatra in 1966, though marred by the extremes taken in costuming and staging, solidified Price's place as one of the world's great divas. 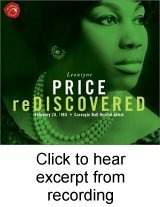 In the years that followed, Price's notoriety allowed her the freedom to select roles she wanted, often taking rests between runs. She increased the number of recitals in the 1970's and made several operatic and concert recordings, earning 18 Grammy awards over the years. Price retired from the opera stage at the Met in 1985 with her signature role, Aida. This live telecast was viewed by millions, and her performance of the aria, "O Patria Mia," was the top ranked "Great Moments at the Met: Viewer's Choice" selection. Price has been described as a "lirico-spinto" soprano with a 3-1/2 octave range. Her rock-solid vocal technique and purity and her dramatic flair have been combined to create a mix suitable both for the opera and concert stage. Musical excerpt: "Vissi d'arte" from Tosca by Giacomo Puccini. Recorded by Leontyne Price and David Garvey, February 28, 1965. RCA Red Seal/BMG, 2002. Afrocentric Voices in Classical Music. Created by Randye Jones. Created/Last modified: June 11, 2015. Accessed: . http://www.afrovoices.com/price.html.